Were these meaningful moves for long-term investors, or just noise? 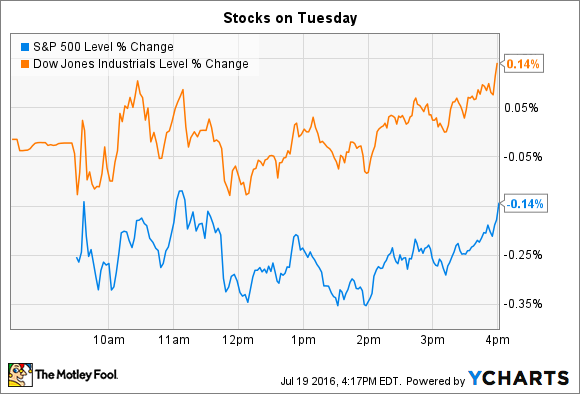 Stocks turned in a mixed performance as earnings season heated up on Tuesday. The Dow Jones Industrial Average (DJINDICES:^DJI) rose for its eighth straight session to gain 30 points, or 0.1%. The S&P 500 (SNPINDEX:^GSPC) fell slightly, dropping 3 points or 0.1%. Netflix (NASDAQ:NFLX) and VMware (NYSE:VMW) were among the day's biggest movers after the companies posted second-quarter earnings results. Maybe the Netflix service isn't worth a few extra bucks per month, after all. The streaming video giant logged a 13% decline following a significant miss on Q2 subscriber growth. Net new members came in at just 160,000 in the U.S., compared to management's forecast of 500,000 . CEO Reed Hastings explained in a shareholder letter that management was surprised by an uptick in cancelations that coincided with a spike in press coverage about its plan to "un-grandfather" its long-term subscribers. These members were told about the pricing change two years ago, but many of them interpreted this move as a new increase and decided to end their service rather than downgrade to a cheaper plan or continue at the higher fee. On the positive side, growth in new members met management's target even if a surprising portion of the existing user base revolted over the higher price. Hastings and his team believe this challenge represents a short-term speed bump. "People don't like price increases, we know that. It's a necessary phase for us to get through," he said in a conference call . Consequently, growth in the U.S. will be constrained as un-grandfathering continues in Q3 and wraps up in Q4. In the meantime, the resulting boost in average revenue per user is driving higher profits and will give the company extra cash to fund upgrades to its content portfolio and streaming experience. Virtualization specialist VMware (NYSE:VMW) saw its stock spike 9% after it beat consensus estimates on both the top and bottom lines. Revenue rose 11% thanks mainly to rising demand for its subscription-based cloud services. Earnings improved by 54% to reach $0.62 per share. Because those subscription sales carry a higher margin, bottom line profitability improved markedly. VMware generated $265 million of net income, translating to a 16% profit margin, compared to $172 million, or 11%, in the year-ago period. "This was another good quarter for VMware," Chief Financial Officer Zane Rowe said in a press release. "I'm particularly pleased with our financial performance and increasing strength of our balance sheet ." VMware turned in a mixed performance with regard to expenses. Research and development spending rose at a faster pace than revenue, which isn't surprising given all the software initiatives it hopes to roll out and support in the coming year. On the other hand, sales and marketing cost growth was muted, rising by just 5%. Investors were likely most pleased by spiking cash flow. Free cash is up 50% through the past six months to $1.2 billion. That, plus the $9 billion that VMware has sitting on its books, should easily fund management's aggressive stock repurchase plans without requiring a slowdown in business investments.